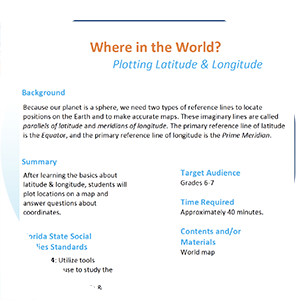 Actvity Summary: After learning the basics about latitude & longitude, students will plot locations on a map and answer questions about coordinates. Because our planet is a sphere, we need two types of reference lines to locate positions on the Earth and to make accurate maps. These imaginary lines are called parallels of latitude and meridians of longitude. The primary reference line of latitude is the Equator, and the primary reference line of longitude is the Prime Meridian.